We are finally rolling again! On Wednesday at 5 a.m. Charlie carefully maneuvered our skinny Winnibago down our very steep and icy driveway and onto the highway. A look at our driveway in winter. 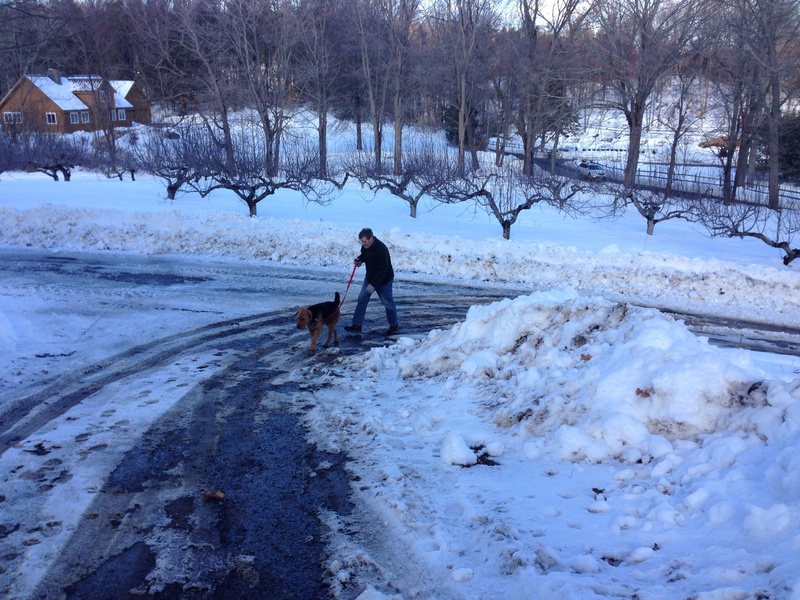 Charlie and WB walk up our driveway. FD Roosevelt State a Park, Georgia. We drove I-95 to Petersburg, Virginia in an icy rain, with temperatures hovering between 34 and 36. On Thursday we continued on to Charlie’s good friends, Chuck and Linda’s lovely home in Statesville, North Carolina. Chuck treated us to a gourmet dinner of shrimp, fresh tomatoes, basil, black olives, and pasta. We toured the city of a Statesville the next day, and again relished Chuck’s culinary skills at dinner time, and we made them promise to come stay with us so that we may reciprocate. 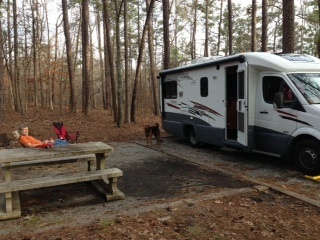 On Saturday, we traveled through South Carolina and are currently camped at FD Roosevelt State Park in Georgia. It is 70 degrees and sunny, and quite nice after the winter we have had! This park is near where FDR had a vacation home near Warm Springs and developed his New Deal policies based on his Georgia experience. One can see his hand controlled 1938 Ford convertible at Roosevelt’s Little White House Historic a Site. Now, those of you who follow this blog know that we visited Campobello Island, another great Roosevelt vacation place, last summer. FDR had excellent taste in finding great places to visit! This entry was posted in Uncategorized on February 22, 2014 by Ramblin' Rose. Sara: Alicia and I were discussing when/if you had been able to begin your journey with all the bad weather along the East Coast. Glad to hear that you are enjoying 70 degree weather! Dot, we kept having to delay our departure, finally made a run for it! Thanks for thinking of us. Good thing you had a good plow guy to get you off the hill!! Have fun 🙂 Pa looks relaxed already on Day 4 !!! Shan, our plow guys are the best! 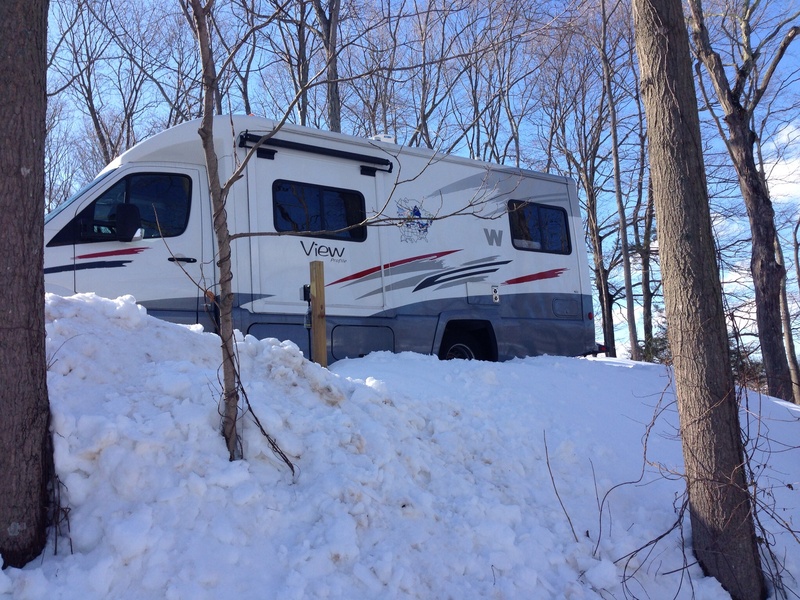 Thank your hubby and crew for miraculously giving us a chance to escape the winter. Much appreciated!